The University of New Mexico has had 125 years to cultivate its postcard perfect green space. At every turn people are greeted by well-tended gardens, contoured grassy knolls and regal trees of all shapes and sizes. Bryan Suhr and his staff are responsible for the trees on campus, 5,000 plus. Suhr is UNM supervisor of arboriculture, but you can call him the "tree guy." An Albuquerque native, Suhr has been at UNM for 19 years. As an arborist, he specializes in the cultivation and care of trees and shrubs, including monitoring their health, identifying and treating problems, planting, pruning, maintenance and on occasion, removal. To Suhr, a second generation arborist, it’s more than a job. He feels a deep sense of connection to trees. “My dad is no longer living, but I often think about him, especially when I see trees he planted around campus. He had many clients in the community and took care of trees at several of the residences on Las Lomas,” Suhr said. Trees are more than just another pretty face. They support life. According to a report issued by the United States Forest Service in May 2013, urban forests in the U.S. alone store some 708 million tons of carbon, and have a yearly carbon intake of 21 million tons. Just one adult tree absorbs about 48 pounds of carbon dioxide on a yearly basis and produces enough oxygen to keep two humans alive. Bryan Suhr, kneeling, helps plant a tree during a recent Arbor Day tree planting ceremony. The UNM Physical Plant was presented with the 2014 APPA Award for Excellence at a recent conference in San Diego. The award is APPA’s highest institutional honor and is designed to highlight the essential role of facilities operations in the overall institutional mission and vision. Visit APPA Award for Excellence for the full story, and to see a stunning video produced by PPD Communication & Outreach Specialist, Rachel Stone and KNME, go to: UNM PPD video. 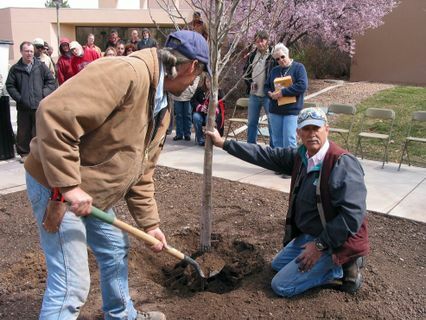 Suhr is a founding member of Think Trees NM. He has several national certifications including International Society of Arboriculture Board Certified Master Arborist. Visit the UNM Campus Arboretum Self-Guided Tour #1.